Yahoo has given its Mail app for iPhone an almighty overhaul to offer a host of useful information beyond the sending and receiving of emails. 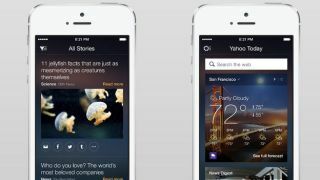 The revamped app now features a personalised News tab bringing in stories Yahoo believes will be of interest to each user. However, perhaps more interesting is the Today tab, which appears to be Yahoo's attempt at replicating the Google Now experience. Within Today, users can search the web, see weather forecasts, and view sports scores, news briefs, stock prices, among other info. While it's not quite as accomplished as the Google-built tool, it's not a bad effort considering it arrives as a bonus within the Mail app, rather than a standalone app in its own right. The newly integrated experience gives Yahoo users a reason to download the Mail app rather than simply hook up to the stock iOS Mail service. That's something Google hasn't yet accomplished with the Gmail app for iOS.